And generally speaking, fall is busting out all over. As a final point before I go embroider fish, (still the stole): Sheep have got enough sense to go in from the rain (eventually) and also enough sense to break into the chicken coop and try to hold chickens hostage until someone admits where we keep the corn. I’ve got cinderblocks in front of the chicken’s door now (Freyja belly-crawled in there – and out again) and I’ve told the sheep I don’t negotiate with terrorists. This may well be a lie, but I’m going to keep the sheep from knowing that for as long as I can! You can hang pictures anywhere you want. I suggest you hang them somewhere you can see them, unless they’re really ugly. Yes, putting a mirror in a chicken coop would be fine, but they don’t really need one – most birds I’ve known only play in the mirror when they’re lonely. If you hang a (well tied) bright shiny bead or large button, though, they’ll attack it with great gusto. We’ve also found the game “peck the wall” to be popular. Knitting St. Bernard fur works fine. Knitting actual St. Bernards is awkward, and hard on the dog. Seahorses are awesome, good call! If you think that veil is ugly, check out this one! (ok, you’re right, it may be a draw). I’m sorry I ever said it! Obviously “poor boy” sweater patterns are tough to find. Try old copies of McCall’s Needlework and Crafts, or check the comments on this post because I bet Mom can think of a place to try. And now I’m off for an all-day Adventure With The Ed, while Raven stays home and minds the broody hen. I’ve been reading Shannon’s blog for a while now. She’s one of those people, you know, that I consider a sort of friend, even though we’ve never met, definitely a kindred spirit in many ways. She hasn’t been posting much lately, because she’s had a lot of changes going on, been very busy. But her husband Mark just very kindly posted on her behalf – a couple of days ago there was an awful fire. Shannon and her girls got out safely, although it was very scary and a damn good thing the fire department responded quickly, but her new home is destroyed, her animals did not escape, and they lost pretty much everything. I’m just heartbroken for her… please, everybody, keep Shannon and her family in your thoughts, or prayers, or whatever means you use to convey happy, hopeful wishes through the aether. Being as she has no actual place to live, she’s requested people not try to send “stuff”, but if people desire to give, she requests donations go to the Red Cross Office in Astoria or your local red cross, as they have been amazingly helpful. Another friend is collecting paypal donations, if anyone wants to donate, please please send funds via PayPal with the heading go-fish to katebucko AT yahoo DOT com. (Posted in Shannon’s comments, you could email Kate for more information on that). Mark is going to try to keep people updated on how/what she’s doing. Oh, [many bad words] I just want everything to be ok…. The ewes that will be moving in are Black-Faced Suffolk. 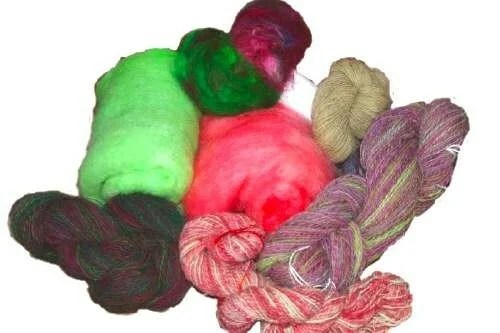 Their wool is a medium grade, (24-26 micron). It’s not the same as the wool Ron found for me, although I’d thought at first it was. They’re not actually double-coated, but this stuff seems to be a bit hairier, sort of halfway between the blanket fleece and the (really surprisingly soft) Whatever-It-Was-Ron-Got-Me. I will know better when I spin it, I guess. I really haven’t got much experience yet, certainly not enough to make a learned pronouncement on raw, grubby wool. (I know the micron thing because I looked it up on that link up there.) It pre-drafts nicely. Their wool is nominally white, but the black coloring from the face does work down into the neck, so I am finding variable amounts of black in the fleeces. I don’t know how much black will be on the sheep moving here, I haven’t been introduced to them yet. The black wool, which I have never seen before, is really black. I guess for some reason I was expecting charcoal, or something, but no. Black, black, light-absorbing, dark-as-Chaos-and-Mayhem black. Neat. I will have to see whether there’s enough to sort out and keep totally separate so I can have black sheep socks, or not. A lot of the black I’ve found so far is too tiny to do anything with, because it’s up around the face and really just wooly lint. There was one sheep in the flock named (unsurprisingly) “Blackie”, and if I happen to have one of her fleeces, I’ll get socks. Most of them were almost completely white, though, and I don’t know who-all’s fleece I got, out of the pile. Obviously that is “clerical stole”, not “pretty lace shawl thing”. There’s been progress on the Victorian as well, but not in any way that shows, it’s all been seam finishing and such, so although there are pictures, I’ll save ‘em for that tutorial I’m still promising. Did spin one skein of the amethyst (oh, like you thought I might actually wait? Right.) and I’m pretty happy with it. It’s six plies – I didn’t want to waste a scrap, and I did want the colors blending, so I andean plied it first, and then chain plied it. So it’ll be… variegated tweed? the colors in that picture above are actually pretty good – I know, even to me it looks like a bad picture, but it’s not. A bit pink, but as close as I could seem to get. Have I mentioned about my poor impulse control? I might – just might – accidentally, of course – have acquired some more fleece. It was very inexpensive, because some of the fleece is still being used: Some sheep are coming to live with us. Their previous Person With The Grain Bucket (a.k.a. Marianna from Thorndale) is paring down her flock, and so they haven’t got anywhere to live, and although they will certainly be able to find other homes because I’m sure they’re very nice sheep, I bet other people won’t treat them as well as I will. I will treat them so well that they’ll probably be sick of me, because it’s taken me two years to relax about the chickens and not fret every time one of them appears slightly under the weather or has a few less feathers than usual. And I haven’t got a leg to stand on. We had baby chickens on the hearth all last winter, plus Brat the HouseHen, recovering from her Horrible Foot Incident. Really though, I have no intention of bringing sheep in the house. They’re too big to sleep on the hearth. Except maybe a lamb. I am almost entirely kidding. Look, we’re building a shelter for them! I’m kind of terrified about this. I mean, I can deal with sheep, I’m sure I can. But, little added twist about these ewes? They’re pregnant. Up the spout, knocked up, buns in the oven, due in midwinter. Yes. There WILL be lambs. Cute baby lambs, in oh, January or so. Raise your hand if you think I’m going to be camped out in the barn frantically knitting little lamb-cozies? Man, I love it when Jodi links to my teeny tiny site, here – you guys are going to break the counter, you know it? Thanks for clicking. Anyway. I desperately want to give you a “real” post here, to wit: a sorta kinda how-to thingie for the Victorian bodice, as a) I’ve been given to understand that some really easy parts of it are “hard”, and want to correct that misconception, and b) people keep google-ing me with “victorian costume” and it makes me feel all bad to not have done this already. But alas, I am really behind in my work, and totally distractable by things like stacking wood, pampering broody hens, and ehemRAVELRYehem, so I cannot, nay, must not give you said instructional and interesting post (we hope) until I’ve got the bodice to a point that more closely resembles – well – finished. And hopefully on its way to its new home in Californ-i-ay. That would be best. I was going to put up one for the cute baby lovers too, a pic of my niece discovering what flowers taste like. But wordpress seems not to like this picture, it keeps getting weirdly distorted during upload, so we’ll just take that as a sign from the gods and give it a miss today.